Along with the ongoing work to build a new management office and an office for the public safety department in Stuyvesant Town, another project is taking place at the building that’s home to the leasing office. He also noted that fliers placed in the building early in January alerting residents to the fact that the work would be taking longer than expected (past January 3) “due to unforeseen circumstances” didn’t mention what the project was. “It’s nothing to do with benefitting the general tenants. It’s being done to make more students move in,” he said. When asked for details about the project, a rep for CWCapital wouldn’t divulge any, only saying that it would be completed by January 24. Fliers that were put up again more recently also noted the new completion date, while classifying the work as a renovation. Meanwhile, since work began, the building was visited by an inspector from the Department of Environmental Protection. A spokesperson for the department confirmed to T&V that there was an inspection for asbestos. However, none was found. made to put up a curtain after excessive amount of dirt from their workspace had managed to fly around the Terrace level and accumulate on floors, even getting into mailboxes. (He also snapped a couple of photos to prove the point.) Still, the rep for the DEP, Mercedes Padilla, told T&V there was no record of an official complaint about dirt. She also said all CWCapital’s necessary work permits were in place. The construction in that building is a stone’s throw away from Playground 8, which is being upgraded as part of the work on the new management office. The area, including a walkway, around 274 First Avenue on the First Avenue Loop, is currently walled off. Last summer, CW said in an announcement that the new management office would be completed in April. However, there were no updates given on the date a meeting held last October about the project for tenants living in nearby buildings. A spokesperson for the Department of Buildings did not respond to requests about the leasing office project. Young resident Karry Kane stands outside the leasing office on Saturday. After Tishman Speyer’s disastrous four-year reign as landlord of Stuyvesant Town/Peter Cooper Village, the commonly held belief was that no one could possibly be worse for the community than that company, with its now infamous business model based around goals that were both greedy and delusional. However, now it seems that the property’s occupying force, CWCapital, is more than willing to be known as the company that’s worse for tenants than the one that lost its investors billions and scared countless tenants out of their homes. By raising the rents at over a thousand units, in most cases by hundreds of dollars and in others more than a thousand or even two, the suits at CW make it clear that they have learned nothing from the historic mistakes of the past. Never mind that the move is just plain cruel ― as noted by Council Member Dan Garodnick last week ― “a mid-lease rent increase of $900 is nothing less than an eviction notice” ― it is also, quite simply, bad business. By issuing these steep increases on such short notice (the extension of one additional month for tenants to decide whether to stay or go is still short notice), CW has essentially said it doesn’t care whether their tenants stay or go. But at these newly inflated prices, who can afford to replace these people (who are already paying for the privilege of living in renovated apartments) other than those who are crammed into subdivided apartments or the very rich? And why would the very rich opt to move into a building without a doorman with an owner who feels entitled to raise the rents at any time? In other words, CWCapital is prepared to deal with a very high vacancy rate, generating no income for a while until the place becomes, officially or unofficially, a hub for students and other transients. Who hopefully for the leasing office agents, don’t read the news. In the past, the owner has offered $500 gift cards as incentives to residents who refer people to sign leases. Interestingly, last week, an offer made by Stuyvesant Town via its official Twitter page for new referrals was for $500-$2,500. So apparently, getting tenants to recommend the place to their friends and loved ones isn’t as easy as it used to be. CW has pointed out, correctly, that it is perfectly legal to be doing this. But so what? Back when Tishman Speyer took over ST/PCV, market rate residents almost immediately began seeing double digit increases. Stabilized renters got primary residence challenges. Tishman did this believing a) that it was legal and b) that the sky was the limit and so what if tenants left, because there was more where that came from. But as we all know now, Tishman was dead wrong. It turned out that as desperate as New Yorkers are for housing, most people simply didn’t have the salaries that would allow them to agree to pay through the nose, nor did they want to live under a landlord who was well-known for giving high rent hikes. Our recommendation: Instead of offering money to tenants to get their friends and families into these renovated units, CWCapital should tell the bondholders to hold their horses. They’ll be paid in full, even if it takes a while longer by charging tenants the rents they actually agreed to pay. It isn’t tenants’ fault that the bondholders signed on to become part of the biggest residential real estate flop in history and therefore, tenants are not who should be made to suffer here. Tenants Association Chair Susan Steinberg talks to a neighbor outside the leasing office on Saturday. outside the leasing office, in which they shared with passersby and prospective renters, what problems they’ve faced after signing on the dotted line (noisy neighbors, broken elevators, etc.). Tenants are also confronting management directly. On the Stuy Town Facebook page, a recent post cheered the reopening of the Oval lawn. The response? One comment seemed to sum things up. In a post promoting a carnival for kids on the Oval, Facebook user Carla Webb O’Connor had this to say. The Tenants Association, local elected officials and now Town & Village are calling on CWCapital to reverse course on the rent hikes. CW should, at the very least, give tenants some warning that after ― and only after ― their leases expire, their rents will go up. Then, CW should charge a rent that isn’t far higher than what’s currently being charged so tenants can actually consider staying. 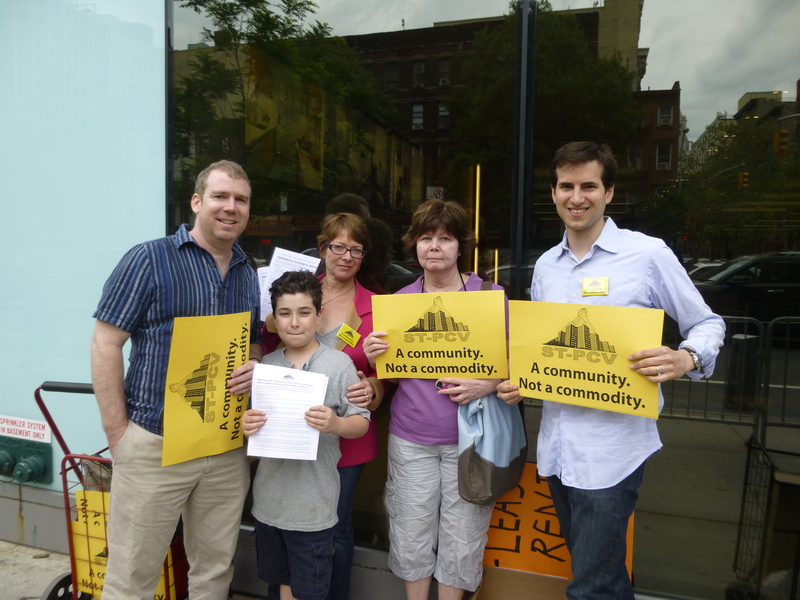 Tenants protest outside the leasing office on Saturday. 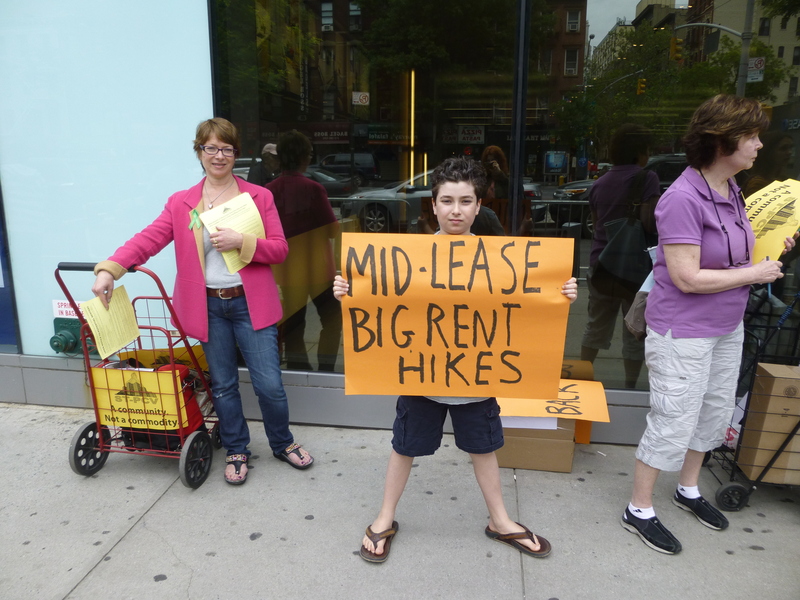 Following the discovery last week that close to 1,300 residents were being hit with mid-lease rent hikes that have been as high as $2,200, the Tenants Association, along with a handful of other tenants, have taken their grievances to the leasing office. The plan has been to have “sustained” picketing, with sign-holding tenants warning potential renters and passersby on First Avenue about the increases as well as various quality of life issues like the lack of laundry rooms in some buildings and bedbug sightings in others. On Saturday alone, TA members said they spoke with with around 50 people outside the leasing office. Most people they spoke with, added Marsh, ending up being concerned about how mid-lease hikes and other issues like broken elevators could affect them. Others, however, simply ignored protesters as they went in and out of the leasing office. prospective renters to model apartments after meeting them at the back of the leasing office. ST/PCV security also, on Saturday morning, called the cops on protesters, asking officers to force protesters to stand behind barriers that were put up over six feet away from the leasing office, close to the curb. However, according to protesters, the cops said the tenants were fine where they were, as long as they remained peaceful and didn’t block traffic. A couple of security officers remained outside the leasing office though for as long as the picketing continued. As for those who were there on Saturday, around a dozen residents were participating, most of whom were longtime tenants, unaffected by the rent hikes that have been issued to “Roberts” class members. “My heart’s breaking for the community,” said Susan Kasloff, a 17-year resident as she handed out flyers by the First Avenue Loop. She also said despite the hike she got, she’ll be sticking around. The increase was for $550, but this follows another increase of $200 when she last renewed her lease in February. 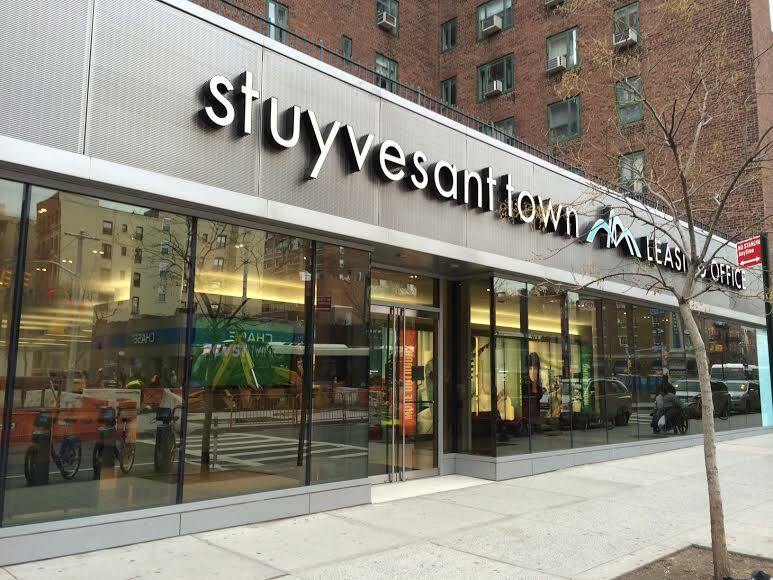 “We love living in Stuyvesant Town, but it’s going to be very hard,” said Aadahl. According to Marsh, the TA is exploring its options, and there has been talk among tenants about a rent strike. However, Marsh said if anything, it would be a rent slowdown, and this would only be done as a last-ditch option since “Roberts” class tenants have a clause in their leases that would allow the owner to hit them with a $50 fee for not paying their rent on time. More longterm tenants however could technically participate in a rent slowdown and not pay their rent for three months before CWCapital could try to evict them, said Marsh. At this time, however, the TA is not recommending that anyone withhold or delay paying rent. In response to the protesting, Brian Moriarty, a spokesperson for CW, said that the special servicer was acting within its rights following the settlement. The rent hikes came on the first day that CWCapital was legally allowed to issue them, which, tenants were warned back in January, the special servicer could do following the “Roberts” settlement. What kind of increase tenants got varied from $100 to $2,200 with most impacted tenants getting increases of hundreds of dollars. Residents were also initially told they’d have two weeks to decide whether they’d be staying or moving. However, the next day CW announced residents would get an extra month. Residents T&V spoke with on Saturday, though, didn’t seem impressed by the concession. Two residents protesting outside the leasing office on Saturday, Sandra Lynn and John Giannone, said they hadn’t gotten increases, but have been hearing horror stories from neighbors who did. Giannone said he found out about them when neighbors knocked on the door to ask if they’d gotten one. “They got a statement under their door that said their rent was going up $1,100 with no explanation,” he said. Another resident who approached the protesters said she was unaware of exactly what her rent hike was, though it wasn’t for her lack of trying. The woman, who didn’t want her name printed, said she was listed one new price somewhere in her lease renewal document and another elsewhere in the paperwork, and said she’s been unable to reach anyone in the leasing office to ask what she’s supposed to be paying. It’s either $600 or $800 more. After going in, she was told that no one in there could answer her questions and was referred to the property’s legal department. However, when she tried to negotiate the rent increase with an attorney, she said he wouldn’t budge. Interestingly, when she later walked into the leasing office with her boyfriend and the two posed as would-be tenants, they were given the impression that there was some wiggle room in price for new tenants. In other “Roberts” related news, the case’s attorney for tenants, Alex Schmidt, said on Monday that an effort to extend the deadline for class members to file for their damages has been successful. The original deadline was May 15 and the new date is May 31. However, if residents don’t file their paperwork by then, their share of the nearly $69 million in rent overcharge returns will go back to CWCapital and MetLife. The extension will likely be seen as good news by a member of the class action suit who approached Steinberg on Saturday to ask what it was all about. The resident wanted to know if he was entitled to anything even though he thought he may have gotten someone else’s paperwork. No one in the apartment, he explained, is named Roberts. However, after getting filled in on what Roberts meant, he said he’d be filing. 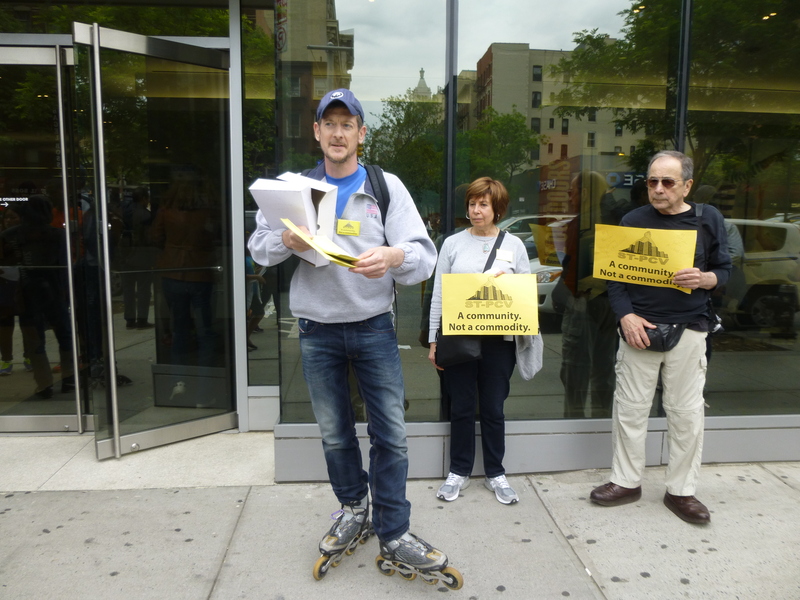 The Stuyvesant Town-Peter Cooper Village Tenants Association is calling for volunteers in an effort to protest CWCapital’s high, mid-lease rent hikes, starting tomorrow outside the leasing office. Hit CW Capital in the Only Place it Knows, its Pocket. Your staggering mid-term rent increase? That you are still slugging your laundry blocks away? 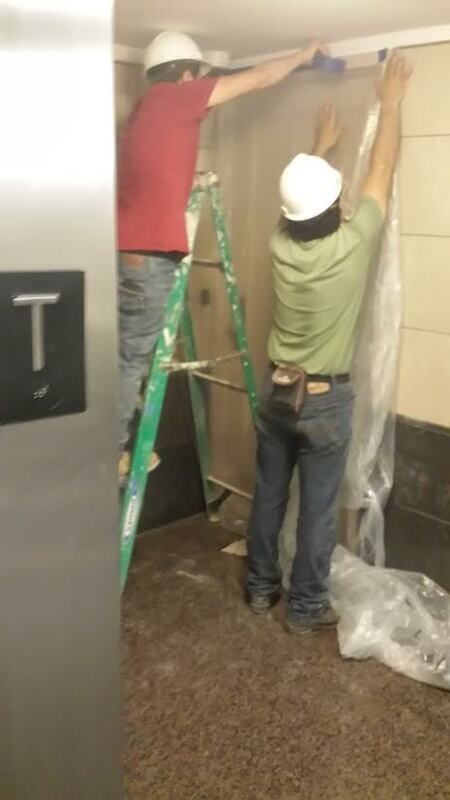 Your’e still without reliable elevator service? Your personal belongings rotting in a shipping container for six months? Tepid enforcement of the rules? Worrying your next service visit might become a police complaint? Now it is time to communicate to CW Capital in green language. Make your thoughts and feelings known to prospective renters and neighbors infront of the Stuyvesant Town Peter Cooper Village Leasing Office. All neighbors, new or tenured, young or old, need to stand together and support this action. A rapid loss of hard-earned neighbors will result in less stablization and quailty-of-life for all. We’ll start this Saturday and Sunday and if enough neighbors respond to our call for weekday shifts, well then we’ll carry on. Each 1-2 hour shift will promote our message of how it really is to live here. We’ll do that by displying hand written posters, distributing flyers to — and talking with — prospective renters in front of the rental office. We’ll tell them about CW Capital’s family busting rent increases. We’ll also make sure prospective renters know about our noisy and inconsiderate neighbors and management’s minimal rule enforcement. Make sure they know of the legal requirement that leasing agents must disclose which builidngs have been infested with bedbugs in the past year. We’ll tell them which 17 buildings have no laundry facililies and have rotting basements and of no schedule of resolution to buidling wide problems. About the recent burglaries and the need to remember to lock up and be present for service appointments. Make sure they understand there is really (wink wink) an 80% carpet rule. And best of all, we’ll give them homework! We’ll ask them to read the blogs likeStuytown Report, EscapeStuyTown, Town and Village Newspaper and the TA Facebook and Official page. Working together we can sustain this for a long time. Retirees and night workers can help on weekdays while folks are working. We have loving grandparents here to help watch young ones while moms and dads take a shift. Can’t make a full shift? Stop by and support your neighbors. Bring water or just a smile. Join an adhoc tenant advisory legal committee to explore legal options. Post flyers in your building.